My husband and I have been working on a version of the Wishing fabric as well, and I want to share because I'm so excited about this! We're also going to be doing a few more shades of blue. This is just the first. Thoughts? Suggestions? Now to save up to buy enough to make myself a gown! So I stumbled across this vintage dark green velvet cape with bright green silk lining at an antique/vintage shop near school. Only $18. So guess what I'm doing? That's right, folks. First ever (to my knowledge anyhow) fan-made Monsieur Firmin Masquerade cape. Going to use these bits form big gaudy earrings I bought years ago on super clearance at Macy's as ornaments on the cape. I *knew* they'd come in handy someday! I have some gold cord and tassel curtain ties lying around somewhere, which will come in handy as well. Should be fun and relatively easy to put together. ^ LOVE THIS ! Cant wait to see the cape finished! Aria: of course you can make a closer design than mine... True but what about copyright infragment? The original design isn't yours or mine. Thanks for stealing me the idea by the way. This was helping me to finance my own wishing dress. It's not very FairPlay . I shouldn't have share this at all. Melly wrote: Aria: of course you can make a closer design than mine... True but what about copyright infragment? The original design isn't yours or mine. Melly, I hope u keep your fabric available...I still need to order ur swatches!!!! Great, I can't wait to buy them!! We were working on our own before I ever saw yours. So how is it stealing your idea? About a decade ago I started wishing for a way to make a fabric closer than a generic blue print, and about a couple months ago I started learning Photoshop, and after seeing the 25th anniversary production, started working on this after mentioning to my husband I always wanted to find a fabric like it, and he asked why I didn't try making one like we did with another fabric. I thought it would be overwhelming, so he did our first version, and then I did the second after observing him. Your version wasn't brought to my attention until a little over a week ago, after our swatch was already ordered. So why should I just give up something we put a lot of time into? Neither you nor I own the idea. 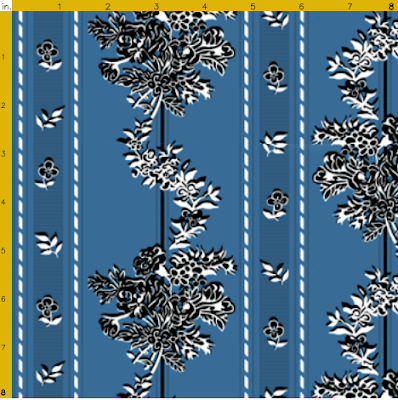 Someone else could come along and offer an even closer version, or the owner of the original going decide to offer the fabric for less than Spoonflower. Are you suggesting I decide to write off our time and remove our version from Spoonflower? Sorry, but I'm not going to. I know what it's like to want to make something that costs more than I can afford. Story of my life. There are many things I want to make that are little more than pipe dreams because of expense. Also mine isn't exact (our first idea was to try to be as exact as possible, then decided to make some changes). It's different enough to be a copyrightable derivative. That was important. I wouldn't be surprised at all if plenty of people prefer your version. Yours and mine are both different in several ways, both in design and in color. Some people prefer scrolls. Some don't. I wouldn't be surprised either if you outsold me 10 to 1 solely because you're better known and buyers tend to be loyal to those they know better. By the way, your Rapunzel painting fabric is on my to-buy list. No drama intended I won't ask you to remove your design of course, and you're right, it has taken several hours to complete this. Just understand how suprised I am by seeing that after 25 years of "searching how to reproduce with paint, stamps, the original fabric to make a reproduction by the phans", and suddenly when I've got a solution that works "not so bad", some other people are magically making the same thing (?). I trust you if you say that you had the idea before or something like this, because I don't want to discuss this for hours. I ran my design by an attorney earlier this week to make sure since our "think" is to reproduce film and stage fabrics. I'll continue to run each design by her before posting since we can easily, very easily, step over the line. It's all right to have something look close enough to pass for the real thing upon first glance, but there are so many differences that must be in place, when comparing to an original it must be different enough, must not contain individual elements that have a copyright (like if someone created a scroll and got a copyright on that, then that scroll can't be used even as a part of another design, or else you can be sued, like some movie got sued because a character had a facial tattoo similar to Mike Tyson's), etc.. Generic elements can't receive copyrights, like dashes, flowers, etc., though you can copyright an arrangement of them. To be on the safe side, we're going to file copyrights on our overall designs. Any we don't end up getting copyrights on are obviously too close, and those we do are different enough. It helps when filing to have the designs publicly available so that, if there is a copyright holder, they can raise objection. Spoonflower has been soaring in popularity over the last year or so, and this is opening the doors for people who've wanted to design, but couldn't find an affordable place to have printing done, and Project Runway has shown fabric-printing, which had furthered the interest in this. If it wouldn't violate a client's privacy, I'd give you the e-mail address of someone who initially contacted me February of last year, and she's the one who sparked me and my husband on the path to reproduction fabrics. I was just overwhelmed by Photoshop, though thanks to a significant tailbone injury on Wednesday (ended up in the ER and have ben nearly unable to walk for the last two days, incredible pain), I've had little else I could do. Hurts too much to sew, so, being motivated by new fabrics we're working on, I decided to revamp this one. You've been doing this a lot longer so are probably quite fast at it, but I'm sure you can understand how a beginner would use a LOT of time. You posted your fabric recently enough that I don't think a try beginner could have started from scratch and had a finished image ready to upload and have received the swatch from Spoonflower. It takes about a week for Spoonflower to print and ship, and a few more days for the mail. We got the swatches today, the notice on Tuesday that they were shipped, and we'd uploaded them Wednesday of last week, the 21st. You posted on the 15th, so that was only six days. Not nearly enough time for a beginner. I'd almost given up from being overwhelmed, until my husband told me he'd already been working on it. I didn't think he'd had the time, but he'd been working on it in his spare time. Oh, and as for stamps? Don't even get me started on the disaster 12 or so years ago when I bought a lot of blue fabric and tried using fabric paints with stamps and some white paint to get flowers, and it was...awful. AWFUL. Oh, and also. Your icon? I saw a larger version on Deviant Art and it inspired my bathroom paint colors. At some point I want to get a print to frame and stick in there. OK folks, further discussion on fabric recreations should be confined to Private Messages. I don't think there's much to add to the discussion that concerns the recreation of Phantom costumes. Thank you. Is anyone here on the board working on the Countess costume? Operafantomet...I can't recall but are you working on this costume right now? I know you are reproducing the Sylvan Glade costume which is beautiful! I know another costumer I'm friends with on FB is working on the Countess costume... I think it's one of the most detailed and I would think difficult but would love to see some reproductions of it! It's all right, Melly and I get along now. Turns out she's working on a fabric I'm waiting on a swatch for to make available. It happens. Which countess costume? It's 4am and my brain is almost asleep. The next Phantom costume I'm making is a full-blown Star Princess costume for my toddler. She loooooooooves Phantom. This video should serve as proof for how many times she's watched it. Listen when Andre and Firmin bump into each other and scream. At that EXACT moment, she does too. She knows. It warms my heart that my daughter loves Phantom so much. Her record for watching it is 7 times in a single day. I know, I know, tots shouldn't watch so much of anything on a screen, but she dances, she "sings," she grabs my hands and gets me to dance with her, so I don't see the harm. The screen isn't babysitting. We watch and have fun together. And this scene...Masquerade is the one that gets her every time. Since she loves frills and swirling, it just seems like the perfect dress to make her. Dozens of layers of tulle, and her favorite pink! I might cheap out and now use silk for the top, but it wouldn't be that much to use silk for a toddler-size dress. We'll see next month. Better PotO than Barney, I say. Devon wrote: Is anyone here on the board working on the Countess costume? Operafantomet...I can't recall but are you working on this costume right now? 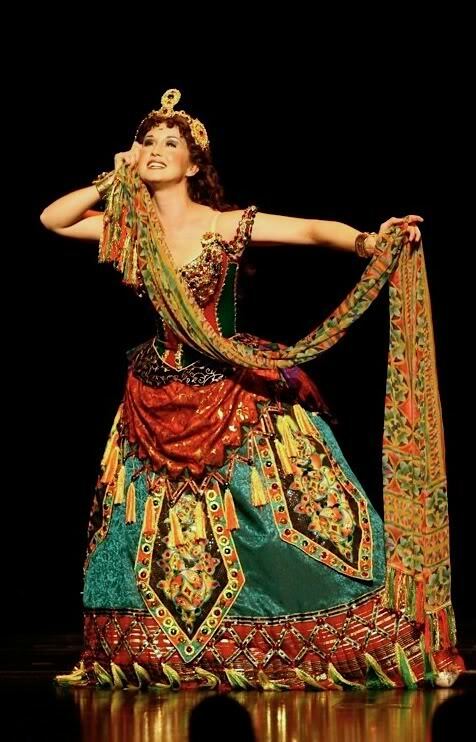 I know you are reproducing the Sylvan Glade costume which is beautiful! I know another costumer I'm friends with on FB is working on the Countess costume... I think it's one of the most detailed and I would think difficult but would love to see some reproductions of it! LadyCDaae wrote: Better PotO than Barney, I say. Ew, Barney. Barney's banned here! Ah! I would have considered that to be the "Think of Me" gown. It's beautiful! StrangerThanUDreamt wrote: ^ LOVE THIS ! Cant wait to see the cape finished! Thanks, Stranger! I'm pretty excited about it, too. The rest of Firmin's costume can easily be cobbled from my Phantom/Raoul costume suits. I wish the cape had a collar. Maybe I can find some sort of fancy scarf and tack it on to make a mock hood/collar effect. The last Sylphide headband is up for sale! I won't be able to list another one. I love these headbands. Why is this your last one? I don't have any more of the rosettes. I wish I could make more because it's so awesome that people seem to really like them. I did/am making other headbands inspired by the Phantom costumes though. That little starburst thingie on the apron? Darn, you folks are too good.